Born in Majorca c. 1232, three years after the Christian conquest of the island (1229), Ramon Llull had very close contact with Muslim culture. It was not until after he was thirty years old that he gave up his life at court and began to study theology and philosophy. Not long after that, he purchased a Moorish slave in order to learn Arabic. This proximity to the Muslim world gave him an exceptional insight into religion and culture which set him apart from all the intellectuals in the Europe of his day. A tireless traveller, he visited the principal courts of Christendom to rally support for his projects, and he did so while engaging in an intense missionary activity to convert Jewish and, above all, Muslim unbelievers. 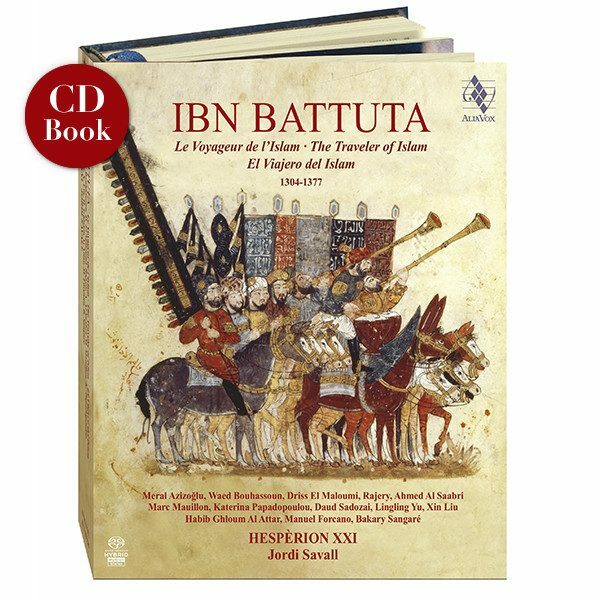 Meanwhile, he also wrote more than 260 works in Catalan, Arabic and Latin, which were widely read in his own lifetime and were brimming with new ideas which had a major influence on the development of universal thought. In his Ars generalis ultima he developed a method intended to be used in religious debate, but which he also applied to scientific subjects and demonstration. After going on various missions to North Africa, Llull died at the age of 84 on his way back from one of his final attempts to engage in religious discussion with Muslim scholars in Tunis, where he was stoned and imprisoned. The musician considers whether the voices are high or low or of middle range, long and short, full-bodied and thin, in proportion to the accents of the vowels and consonants, so that he may adorn the voices and the melodies of the instruments which are pleasing to the ear and thereby cheer the hearts of men. More than 700 years separate us from the time of Ramon Llull, whose work has attracted the attention of such major figures as Giordano Bruno and Leibniz. Indeed, he continues to be a source of inspiration and beauty, making him one of the most outstanding writers and poets of medieval Catalonia. He lived in an age of great cultural splendour, which was characterized by the (not always) peaceful coexistence of the three religious cultures of his time: Christian, Muslim and Jewish. A famous and prolific author, Ramon Llull epitomised the universality of his time in a written output which transcended borders and made his new combinatory language a tool for seeking truth and understanding between cultures and religions. 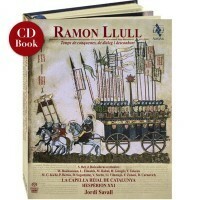 Certainly, the medieval Catalonia in which Ramon Llull lived was very far and very different from that of the present day, but the emotion and beauty of the music and recited texts which accompany us on this journey illuminate the most important events of his life and offer a glimpse of the hopes and feelings of the people of his time. We do not know whether he was himself a musician, but we do know that he loved the art of singing and many of Llull’s poems were written to be sung and set to music. As the eminent musicologist Higini Anglès confirms in his brilliant study, La Música a Catalunya fins el segle XIII, “therefore, although he did not compose new tunes for his songs, he often indicated the tune to which he wished a particular poem to be sung.” Accordingly, we have used the music of Giraut de Bornelh’s exquisite lament No puesc sofrir la dolor as a musical vehicle for Llull’s personal poetic lament, Lo Desconhort. 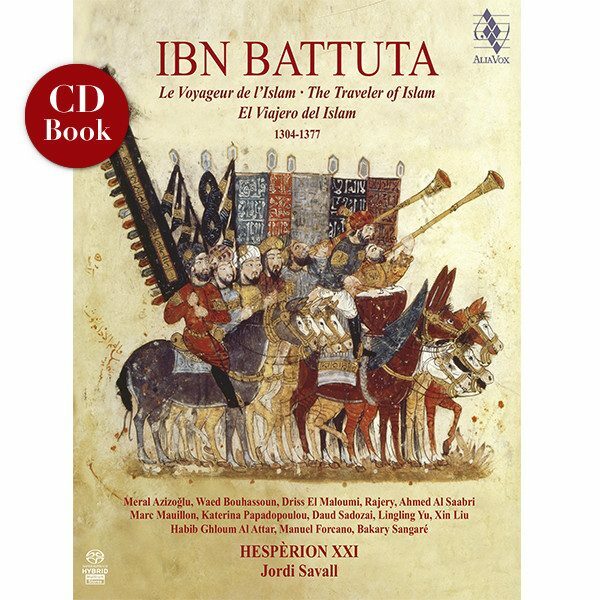 In this CD-Book, which was recorded during a concert at the Saló del Tinell in Barcelona to mark the beginning of Llull Year in the 700th anniversary of his death in 1317, we recreate the soundtrack to Llull’s life; we discover Muslim Majorca as we listen to the taksims (improvised preludes), the Moorish dances, the Muwashahs and Arab laments, all outstandingly performed by modern-day musicians from Syria, Morocco, Turkey, Greece, etc., who are the true custodians and the new (re)creators of this ancient intangible heritage. 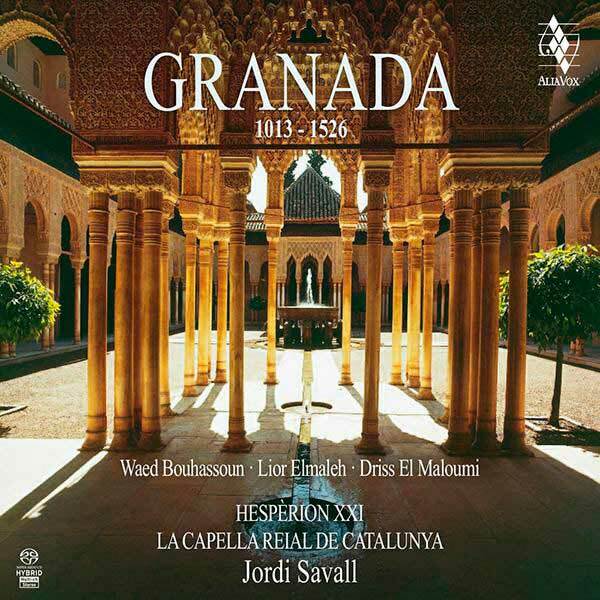 The medieval instruments of Hespèrion XXI, the Eastern musicians and the voices of La Capella Reial de Catalunya perform songs, sirventès, laments and profane dances composed by troubadours, poets and minstrels such as Raimon de Miraval, Pèire Cardenal, Bernat de Ventadorn and other anonymous poets who were active at the royal courts of James I, Peter II, Alfons II and James II. 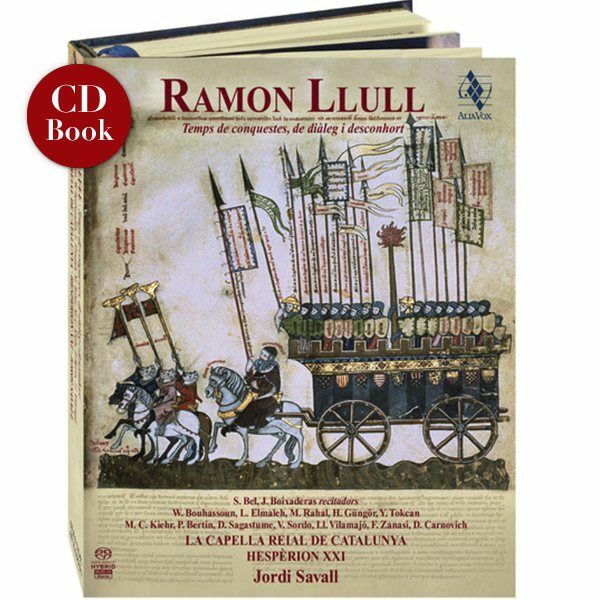 And also the most representative sacred and spiritual music of the age, alongside Eastern music of Arab and Jewish origin, which, with their emotion and beauty, evoke for us the key moments in the life of Ramon Llull, his travels and the main historical events of his time. 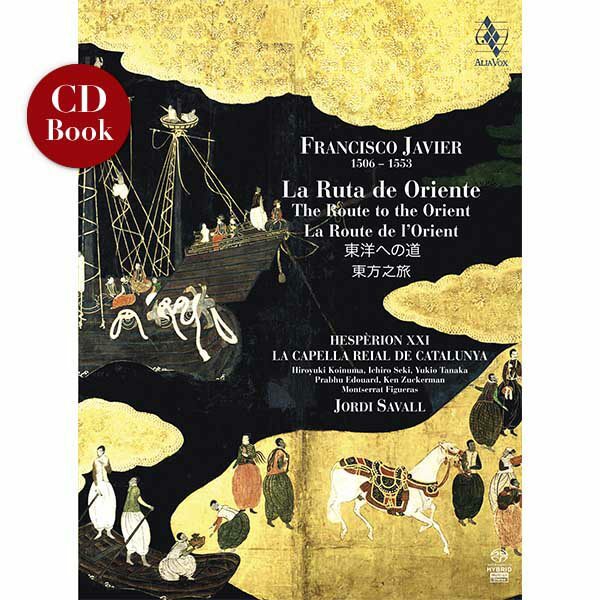 This rich mosaic of music and song is complemented with fragments from some of his most important texts, taken from the Book of Contemplation, the Vida de Mestre Ramon (Ramon Llull: a Contemporary Life), the sublime Book of the Lover and the Beloved and The Tree of the Philosophy of Love, and other commentaries – all wonderfully recited with the distinctive music and declamation of their original languages by Sílvia Bel and Jordi Boixaderas. These texts convey with eloquence and determination the course of Llull’s life and his belief in the need to educate, explain, reason and, above all, to impart the light and truths of his Christian faith to those who believed in other religions through dialogue and rational dialectic based on knowledge and wisdom. His critical thought, at once passionate and inspired, is addressed to society at large and especially to all believers, whether Christians, Jews or Muslims, always guided by a great sense of commitment and driven by his immense personal generosity. His work explored an extraordinary breadth and variety of meditations and proposals, all of which sought to raise human beings to the highest levels of humanity and spirituality by means of beauty, knowledge, eloquence and respectful dialogue. Today more than ever, Ramon Llull serves as an example of one who lived intensely as a man of his time, who faithfully followed his ideas and principles to their ultimate conclusions, firm in the belief that art and knowledge, spirituality and dialogue were the essential tools to improve and change the world. A thinker, poet, philosopher, theologian, orator and missionary, all that he did and achieved in his life is the unfailing testimony to a body of exemplary teachings that are still relevant and necessary today. That is why we believe it is important to keep his message alive by studying and making his work known in Catalonia and around the world through the beauty of these music and texts through which we remember him. In so doing, we ensure that his spirit will continue to be a source of light and wisdom, which are so necessary in today’s directionless world, in which violence, fanaticism and stupidity increasingly and inexorably distract us from the ideals for which the great Ramon Llull lived: those of a civilization where humanism is grounded in teaching and dialogue, spirituality and beauty.